An article that is in many ways a 'Survey & Examples Checklist' for the author's benefit at the start of some 2yo off-season study. But, will hopefully have something in it to interest most people. The Winter being a chance to review what methods B2yoR is using to analyse 2yo Racing and check whether they add any real value. To break the ties to tools which are little more that habits to make a person feel more systematic in their analysis. Also an opportunity to do some research into new areas to see what they have to offer. As a general comment B2yoR would say that not taking time out from the near 365 days a year Racing product in the UK to assess your approach and betting strategy is one of the most common mistakes punters make. It is too easy to convince yourself you have not got time because there are another 5 meetings today and you have to keep up with it all. No you Don't. Specialise. to finally get a proper handle on the types of use of Sectional Timing. Go back 10 years to when the B2yoR website came online, in February 2005, and very few trainers made use of the internet and those that did put very little information on them about their 2yos before they ran. This has changed to some degree and many now put pictures of all their 2yos on their websites, or may use Social Media to make images available. Probably still less than half of the trainers do this, and not including the Big Two with Hannon & Fahey, but enough to make collecting pictures of the 2yos before they run worthwhile. A small number of trainers make videos available of their 2yos undertaking Work Gallops at their Stables or on Public Training Grounds. Watching these has become part of the Profiling pre-race but has reached the point where what value it adds need some further thought. Added to the Pictures & Videos made available by Trainers many of the Sales Companies now make these available as well. A number of commercial companies have developed to provide these services and make having pictures & Videos available an option for Vendors who want to do everything to make the best possible sale for their horses. The increase in number of horses sold as 2yos at Breeze-Up Sales has risen notably in the last 5 years and probably all the 2 furlong Breezes done by the 2yos before the sale are now accessible online. with B2yoR having put a lot of time into reviewing and noting Breeze Videos in 2014, prior to the 2yo's debut outing, this Winter is a time to check how well those reviews went. What factors need to be captured and which are superfluous? Does how a 2yo went at during it's Breeze correlate with how it runs on the racetrack? Section 2 of the document covers these new 'Visual' sources of information. Listing some of the sources and giving examples. The text around them adding some thoughts about their usefulness and how to use them. The second area of study - Sectional Times - is one that B2yoR cannot be alone in having half-started looking at a number of times over the years. Go back to 2003 and Newmarket made them available on all their races and B2yoR spent some time reviewing them but did not get very far. Without a framework to place the Pile of Numbers generated into, a back catalogue of previous figures to compare them to and tools to process the numbers with, they mostly remained a Pile-of-Numbers. Then that provision of Sectional Times dried up quickly and there have been irregular, teasing, False Dawns ever since. There seems to be some extra momentum about the current provision for the Champions' Series races and the AW Courses. Most importantly some organisations have committed to funding their provision. Enough progress to put some time into assessing the use of Sectional Times fully. Section 3 covers examples of what is currently available with Sectional Times in Britain and one example of their use that B2yoR is looking at. As a general comment if any reader of the article has any suggestions for Internet Links or Books to add to the Sectional Time review then please send it via Twitter (handle is @B2yoR) or e-mail (contact e-mail). It also gives some examples of the approach B2yoR went into rather than Sectional Times which was taking Halfway Positions and associated variables. Some parts of this would seem to fit into what now gets termed Sectional Positions. Going into the Sectional Time study the B2yoR view is that the Sectional Position type work is more visual and intuitive than 'Pile of Numbers' Sectional times. It also gives a Framework to add Sectional Time information into so should help in combining the two methods..
Part of the push to write this article and the reason for the Title was reading an exchange on Twitter where two 'Sectionalistas' were backslapping each other for their acumen. Further noting people who took no notice of timework would end up penniless. When tackled over their smugness one Sectionalista backtracked and said something about how everyone should aim to put the best of all approaches together. So, let us try putting together some Visuals and Numbers and see what we get. Without only campaigning for our own favourite tools. Section 4 takes a lot of the examples in the previous two Sections and see where it gets us when applied, with hindsight, to a single race. In this case it is a race in Hong Kong. The biggest point to come out of the example is how pointlessly parochial a lot of the discussion about Sectional Times and the like is in Britain. Look at a variety of other countries and British Data provision just looks terribly amateur and ad hoc. The equivalent of a bunch of 'Men in Sheds' in Britain trying to put a 'Rocket' into space using the facilities in a lock-up Garage in Birmingham. Inventing rickety, labour intensive, solutions to problems other jurisdictions have already automated and progressed on from. But, interesting to see the wealth of data the Hong Kong punter gets. How useful is it? Would a Punter brought up in the 'British School' of Race and Form Analysis get eaten alive if asked to compete putting their money into in the HK Betting Pools?. The following sub-Sections cover a number of 'Visual' inputs to the pre-race 'Profiling' of 2yos races that B2yoR uses. Each is at a different stage in amount of use B2yoR has made of it along with the confidence in using insights gained. The main outcome of the Profiling before each race is a single Number which represents the Rating the 2yo could run to in the race. This figure is part of what is apparently a 'Bayesian' process in that the figure is amended each time more information becomes available. The most notable later input being the on-the-day Paddock Review report. The 'First Pass' Profiling numbers were made available via the Daily Racecards on the website from 2014. During the Winter 2013-14 B2yoR assessed the use of a number of existing tools as information & data inputs to the profiling. A good number were dropped after this process because they added nothing worthwhile. The Baseline was to use a very simple Algorithm built on the Standard figures Trainers have returned over the previous 5 years for Debut Ratings and average changes (termed 'Steps') from Debut to the Second outing. Some of the existing tools made the average difference from Actual Ratings the 2yos ran to compared to the pre-race Profile figures bigger, i.e. worse. Items such as the 2yo's Birthdate added no value to give one example which you will no doubt hear used by Pundits as a 'Tipping Tool' in early season. Use of known Trainer Methods, their Modus Operandi (MO), in deciding when to start a 2yo's Career and what type of Course and Race Type to target. For example, the Hannons have been starting high class, and often Group Class, 2yos in the very early season maidens at Kempton for more than a Decade. 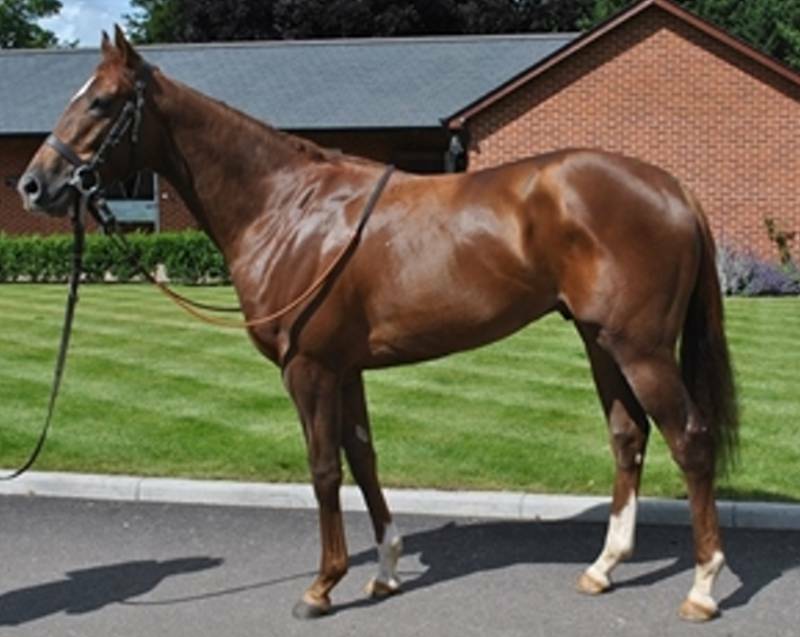 When Tiggy Wiggy ran away with the second race of the 2yo season in 2014 at Kempton you could know a fair amount about her likely ability before she ran or you saw her. Many Trainers 'Front Load' their competitive 2yos as another example. This work and conclusion was useful in then targetting what areas to do more work on with the time freed up from the approaches which were dropped. The first Bullet Point clearly directs the attention towards finding out as much as possible about what Physical Type the 2yo is before it runs. The Phenotype (Genes inherited and expressed) and not the Genotype (the Genes it might, or might not have inherited and what influence they might, or might not, have. If any at all). The Genotype approach would be more commonly known as waffling about Pedigrees, Breeding, Bloodlines, 3/4 brothers-in-blood, Sires-For-Going, etc., etc. Targetting the Horse, and not associated Factors of dubious and unproven worth, makes sense in a Top Level 'Signal to Noise' approach. The closer you get to the Horse itself as a physical specimen and mentally prepared racehorse the more useful Signal there is to find. Hard to believe that there is anything but Noise in looking at 3rd & 4th generation ancestors, for example. Hard to hear anything but Static in the Grandparents possible contribution as well. In 2014 the Profiling work spent much more time looking for Pictures and Videos of 2yos before they ran, and spending time reviewing these. The aim being to identify the really useful elements in watching a 2yo's Sale Breeze, and so on. The second important area of Trainer MO is one where a Database of 'Niches' already existed. This meant that work in that area focussed on how to automatically use the information to inform the Profile Rating. As opposed to sitting there thinking - "Doesn't Mr. Beckett roll out the best of his staying fillies as an early October debut...." - and then checking that fact for the severalth time when October rolls in. The next sub-Sections give a summary of the Visuals Inputs B2yoR has found useful for assessing 2yo's racing quality before their debut and second runs. In 2014 there were 300 juveniles that ran during the Turf Season that were bought at Breeze-Up sales. This was just over 11% of the total runners. The Breezers achieved a Total of 126 wins from 1,073 runs at the Strike Rate of 11.7% while the whole population average was 11.4%. Which meant they won 12% of the total of 1,047 race. Of the 300 Breeze Buys 95 won during the Turf Season at a Winners to Runners (WBR) ratio of 31.7%. The overall WBR in 2014 was 30.0%. The Table following shows the details and racing summary for the most expensive Lots at the 6 British and Irish based Breeze-Up sales in 2014. 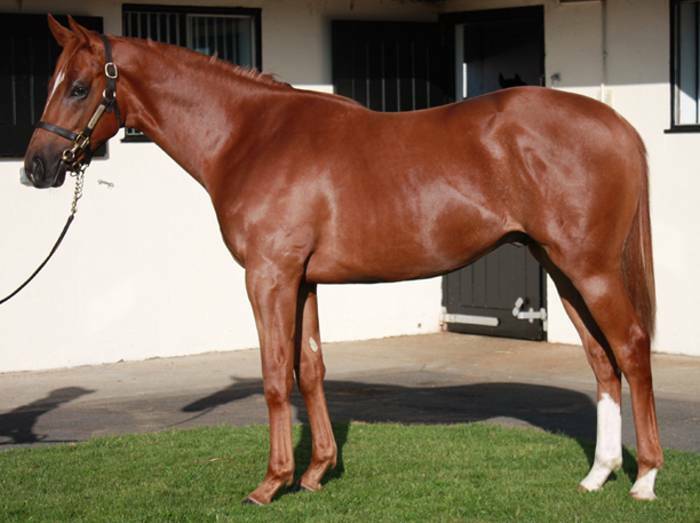 Included is a link to the Video for the 2 furlong Breeze these 2yos did at the sale. Note that the basic outline for the Breeze is to gather the horse before the 2f pole then get it moving and into stride during the first 1f then ask it to up the pace for the final 1f. The 6 'Top Lots' make up a varied bunch as 2yo performers with 3 x solid winners of which one only ran once at seemed to show 2yo Group race potential. 2 others failed to win including the one that cost Coolmore 1.15M guineas and was placed on all 5 runs in Ireland. The other Top Lot did not run as a juvenile. Breeze Video The 'Premier' Breeze Sale where most of the highest prices for Breezers wil be paid. The Breezes take place on the final 2F of one of the tracks at the Newmarket Rowley Mile course. 5 x British 2yo runners in 2014 cost 300,00gns or more at the sale. 3 failed to win with the best win a Nursery off OR86. (270,000gns) War Alert Breeze Video The 'other' Tatts Breeze Sale in the week before the Guineas are run. Breezes on the same Newmarket Rowley course strip. Prices ranged down to 3,000gns. (£340,000) Likely Breeze Video Breezes take place on the last 2f of the Flat Turf Course at Doncaster. The Sale House is adjacent to the Course's Home Straight. No British 2yo winners at Group or Listed level from the 2014 Sale. (£280,000) Goffs used to run a Breezers Only sale in early March at Kempton. In 2014 they created a general 'London Sale' at Kempton on th eeve of Royal Ascot. Breezes done of the polytrack course. New sale only produced 2 x maiden wins by British 2yos in 2014. (£52,000) Breezes done on the last 2f of the Ascot racecourse home straight. 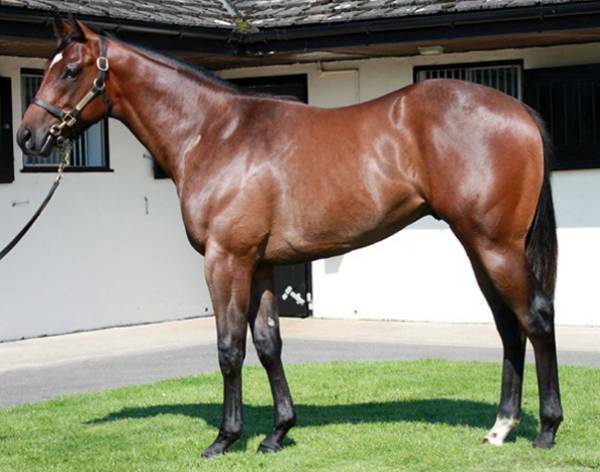 The second Top Lot at £50,000 was Group winner The Wow Signal. The other two lots to make more than £20,000 were Nursery placer Saltarello (£41,000) and Listed victress Bronze Maquette (£40,000). The first thing to note if you have looked at the 6 videos is how variable this all is. Turf and AW surfaces, Flat and Undulating toplogy, pristine Turf through to cut-up 'Turnip Fields', racing on Rails and away from them, high class riders down to unbalanced 'farmers', high and low Camera Angles amongst the range. Hard to get a handle on how to compare different sales because of the varying configurations. If B2yoR had just one comment to make having watched 400-500 Breeze Videos in 2014, multiple times, would be that all Sales should be on level AW/Synthetic Surfaces. Turf courses in varying states of going and repair, up-and-over undulations adds way too much variability. A lot of inexperienced 2yos on the Turf courses looked wholly unable to show what they might be able to do. The figure in the column titled 'Under Tack' is the number of seconds the 2yo took to cover the final 1f. If you want to see what 9.4s looks like then this Video Link should display it in a new tab of your browser. Imagine what that thing would look like bombing down the hill at Catterick on good-to-firm with a bit of a breeze behind it. And the best of luck to the jockey who has got to get it around the sharp bend after the finishing line. Looking through the results for that Ocala Sale then 10.4s would be a slow breeze. The figure on the far right in the result snippet is the price paid in US Dollars. It is interesting, and probably informative, that the prices paid show only some correlation to the Breeze Times. Oh, and the bullet Breezer who cost $560,000 appears to have been named Yiannis but has not yet run by early 2015. Which may also be informative. Look at the US Breeze sales and you are clearly seeing selected horses who have been strongly prepared to be able to do a fast 1f time at the sale very early in their 2yo season. A good, general, question would be is that early Breeze test the best way to develop a Racehorse who will hopefully have a Long Career while staying physically and mentally sound? Another pointed question would be in the hot-housed Breezer environment is the ability to do a single furlong in 10 seconds telling someone anything worthwhile about a horse's long term Racing Career? Even in the US it doesn't tell you how it will get around a bend, or stay 5f or further, or compete in a rough race with 10 other horses. Does that environment encourage those preparing Breezers to push boundaries of acceptability? Whether that mean drugs (legal or illegal), feed additives, training regimes, and so on. In Britain we seem to have a less 'professional' set-up. The preparation is done away from the track from outfits ranging from a few horses up to consignors who prepare 50-100+ horses each year. When you get to the Breeze Day then, apart from the Sale at Kempton, the ground conditions might be any sort of turf and may well not allow the 2yos to 'bomb around' even if they owned that ability. The standard of some riders you see in British Breeze sales would be embarrassing to compare to the, small & compact & well balanced, guy on the Ocala speedball. Some of the riders here could have made that 9.4s into an over 10 seconds one if even they could have controlled the horse properly. Which may be a biased person arguing for taking only mild interest in timing Breezers in Britain. It tells so little of the 'Whole Racehorse' story even in the US and may be less well correlated here. The rider is huge compared to the US guy at Ocala. Nowhere to put his longish legs and not nearly as compact nor neat. SOA is a touch free coming to the start of the 2f but still listening to the rider. The horse does go faster when asked but not out of control and still listening for instructions. The rider never gets the chance to ask SOA for an extra kick in the last 1f because the horse gets unbalanced and wobbles left & right. Despite the wobble SOA does move mostly straight and balanced and nods well in time with the movement. Inclined to blame the wobbles on the ground and give the horse an extra mark for not letting it trouble him and instead quietly working his way through it to finish the breeze still going forward. Which means we end up with an entirely descriptive summary where no numbers, and definitely not a 1f 'blast' time, get a mention. This reminds B2yoR of the process of developing the Paddock Review skills and System. At the beginning that also produced only descriptions of Visual Factors and overall impressions of the horse. Over a long period it became possible to identify important factors in the summaries and start to measure them on a numerical scale. But, this only came with developing experience and was further refined and improved by constantly comparing the Paddock Review figures against actual results, in retrospect. With the pictures gathered on race days assisting greatly in spotting both errors and good calls in the later assessments. The Visual input leading the developments and the identification of useful numerical Factors to be collected in Paddock Review falling out of that process. The notes written about War Alert's Breeze before she ran said :- "War Alert's Breeze VT starts with her looking Sweaty and hard to hold in the gather area. On that you would check her for how relaxed she is in the prelims and not surprised if she was too free in the race. ....... She looks middling size with a strong front but a bit of length and still notably Up Behind (as Blue Aegean looked in her Breeze and another problem with forcing horses to be ready to Breeze). Despite her length she does use her range well and getting her hindlegs well under her later in the breeze. Runs mostly level and straight until rolling right handed 0.5f from the end of the 2f Breeze. Seems a likeable point that she finds another kick when straight again on the rail and niggled by the rider. Should be a bigger type in PRev than Blue Aegean? " Again, it revolves about what you can tell about the horse's physical type from the breeze. Also some thought into the mental type, too free, relaxed, mature and so on. Then the movement is looking at possible factors like Range in Movement, Balance, Finding an extra spurt of speed when asked. The key part of the review of the 2014 Breeze Notes will be to come up with a list of Factors which the descriptions refer to. Then check the Breeze to see if it is a fair record and note any errors. The final step then being to compare how the Breeze looked compared to the debut. Did the 2yo show all, or many, of the same traits when asked to race? Had the trainer tried to change the 2yo physically and mentally so it looked a different horse FTO? You probably get the idea and this is an ongoing development. Endnote - as ever with British Racing if you look at other jurisdictions the 'Men in Sheds' feeling can come back. In Britain trying to assess Breeze Videos seems to be competing mostly with people who do not watch them at all (Great). Then there are some who are trying to squeeze out the useful information by doing 1f or 2f timings of the Breezes (Fine, because the majority of the useful information is probably not in the times). Then you look at the US, say, and they are doing 'Gait Analysis' of Breezers using ultra high speed cameras, see the example on the linked to page. They can then start coming up with useful numbers about how efficiently a horse moves and whether an individual is in the elite level for items such as 'Stride Length'. Oh well, not having an ultra high-speed Camera in the lock-up garage (which is not in Birmingham) will mean having to trust human eyes and the large sub-conscious 'computer' we all have to see whether efficiency is visible in a Breeze. Another thought, as always, is where on earth is Godolphin's 'Gait Analysis' Project? Why are they, if they are, still trusting to the usual bunch of insiders in tweed/baseball caps? [Update - March 24th, 2015 - Trainer Mark Johnston produces a Monthly online Magazine entitled the "Kingsley Klarion". The March edition include the usual 'Straight Talking' feature in which Mr. Johnston addresses various issues. The March edition linked to headlines on a new project Johnston is involved in to get an edge at Breeze Sales by taking times. 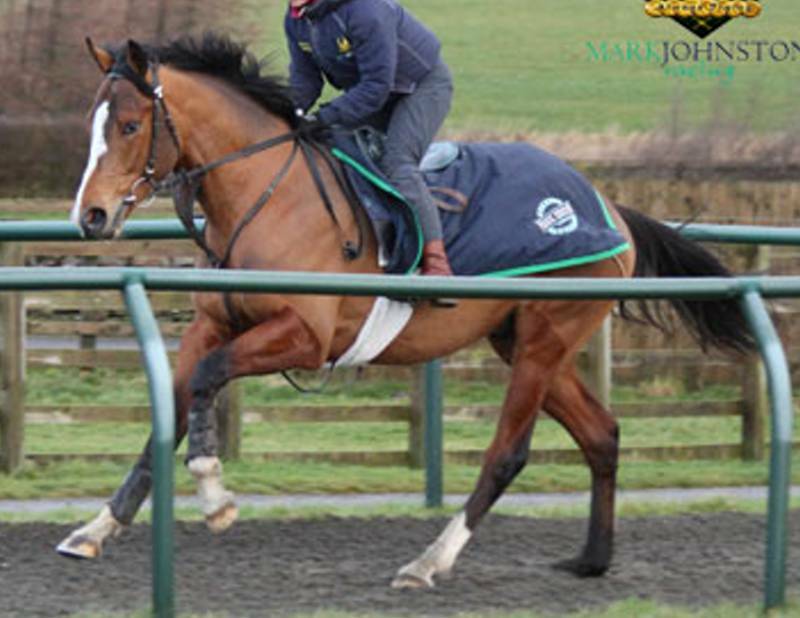 He has become involved with this project because James Willoughby (along a colleague) has convinced Johnston that there is a worthwhile correlation between Breeze Times and Racecourse ability. Johnston attended the early Breeze Sales back in the 1980s when the 2yos worked in pairs and threes but has not gone for many years. His personal view before being convinced by Willoughby (a former employee of Johnston's in the 1990s) was that there was no worthwhile correlation. Mr. Johnston says he will be attending the Breeze Sales in 2015 and funding Willoughby to take times and undertake analysis to recommend which 2yos to purchase. Clearly, an interesting project to follow in the context of general thoughts on Breeze Sales. A small number of trainers now make some Videos available of the Work Gallops done by their 2yos away from the racecourse. The most notable examples are Michael Bell and Mick Channon. A big issue that B2yoR has found with reviewing these Videos is that there is no simple Framework to judge what you see against. In a Breeze Video a single horse runs over 2f with the aim of looking as good a galloper as possible. The Work Gallops are much more varied and the trainers clearly have other agendas which mean the Gallops have to be interpreted with that knowledge. Usually, an outside viewer will have no information about the trainer's motives so you cannot simply believe-what-you-see. The Video below which shows three of Michael Bell's 2yos doing a Work Gallop along a strip of the wide-open grassy spaces of Newmarket Heath and finishing with a 1f to 2f section uphill. The work is from the 15th of October, 2014. The chestnut on our left throughout in the Red cap and with a medium width white face blaze is the 2yo Le Rouquin (unplaced in 3 x Maiden runs). The chestnut in the middle with the Grey Cap and the big white blaze is Storytale (unplaced in a single Maiden run). The shorter Chestnut who starts the Gallop in behind the other pair then pulls out and goes past them on the hill is Them And Us (Debut winner and unplaced STO in a Nursery off OR77 10 days after this work). Have a look at the Video and we will reconvene on the other side to mull over some of the things we might learn from it. Before looking at the horses at all it is useful just to see what this sort of Work Gallop looks like. How the trainers sets it up and what sort of a test is it for the 2yos. We do not know for sure but we would suspect that there is no timing, nor pace measuring, taking place so there are no independent 'Numbers' being produced. If we imagine ourselves as the 'Gallop Report' person for a publication we would presumably be able to get away with saying this trio work together and "...Them And Us went best...". We must be able to glean more information than that from looking at the Video. B2yoR would say you should always try to judge the horse's Size (height & length, the overall frame) and build (how well muscled and powerful it is) from any Video. Both relative to each other and against an Absolute Scale if your experience allows. In this case Them And Us looks a bit shorter and less body length than the other two. But, he looks deep in front and chunky enough with it. Le Rouquin looks Narrower and less bulky than Storytale. Similarly we should try to note how each horse moves. This looks like a medium paced Gallop on the flat (at most) followed by the trio being asked to increase the effort (perhaps just maintaining the same speed) a bit on the uphill. It doesn't seem to put much pressure on the trio. Them And Us never looks to have to do much work to get to the lead. Storytale comes across as more of a galloper then the other pair and might need longer trips. The Gallop seems to be set up to allow Them And Us to try to learn how to settle in behind (he is a bit free on the flat) and then pull out to make his effort when asked. He makes a comfortable job of overtaking the other pair but what does that amount to? Is he 'well in' off OR77 STO? Not on size grounds but he seems to have more zip than his frame suggests. The other pair seem to struggle a bit when asked to increase the effort uphill. Storytale staying on ok but looking a bit slower initially. Le Rouquin seems to have an attitude issue of some sort and rolls around a bit and the rider raises the whip but does not use it. Le Rouquin had his third outing after this work and got an OR55 to start his handicap career. He was unplaced in an AW Nursery and an early January 3yo handicap and dropped to OR53. He was the 7/2 favourite on his first Nursery run and you would imagine Bell thought OR55 was usable. Storytale had not run again when this article was written and presumably a 3yo development handicapper over 8f or more. Which is all very well but how are you going to use that information to assist the choice of bets you make? With the 2yos who are being groomed for handicaps it would help on their first three runs if the Market thought otherwise. Does it help to make a choice over whether OR77 is ok for Them And Us? Difficult to say when he is beating up on two horses who have shown little in early runs and both looking to have 'issues' in this Work set-up. Which means that reviewing the Bell Videos is at an early stage and still trying to look for clues. He does make videos of the unraced 2yos available and that can be helpful but he doesn't get many debut winners. For example, here are the notes B2yoR made on the Work Video Them And Us did before his winning debut :- "Latest work video from Sep 23rd working with winner Berland (OR80) & My Strategy (ran unp at 66/1 in NMKJ maiden 2 days before this race). Looks a slow work and Berland acting as a lead? TAU looking very willing and the small chunky ball he appeared on the Breeze Video. TAU ends up puling to the lead but how misleading is that? Given the whole work looks slower and the other two almost pulling up and TAU exuberance showing through. " Even with some positives noted you can 'hear' the B2yoR reluctance to 'like' smaller 2yos coming through. Here is a Video Link to that Work Video from September 23rd with Them And Us pulling in behind then coming through to lead on the Far Side of the Trio. The OR80 rated Berland is on the Near Side of the Trio with the jockey holding him back notably throughout. Even with hindsight hard to say you could back a 16/1 debut winner on that Video? One of those situations where if you were told that Them And Us "..went better than Berland last week.." you might be celebrating a 16/1 win. You just have to believe that watching the Videos and training your own judgement is still the best route forward. Not listening to 'whispers' which might be right-for-the-wrong reasons, or whatever. The B2yoR pre-race notes for a range of Bell Work Gallops can be found in the Race Result summaries for the 2014 season. Mick Channon has been making Work Gallop Videos available for a long period and there appears to be a large archive on the Website. This is useful because it means you can go back and watch work Videos from 2013, for example. Which enables you to see how Channon sets-up different Gallops, in terms of 2yos chosen and how they were ridden, while knowing what quality of juvenile racehorse you are looking at on-screen. The website also has an explanatory Video on it where Channon does a voiceover to a Video shot from a helicopter as it flies along the various Gallops available. Let us take an example from 2014 in which an older Lead Horse in Tidentime was teamed up with four unraced 2yos of varying ability. To open up the sample Video go to this Channon Gallops Index Page and scroll down to find the 6th May, 2014 Gallop. The 4 unraced 2yos from Left-to-Right in the Video, with a Pair either side of the Lead Horse Tidentime in the Centre, are Moonraker (Debut winner & peaked at OR102), Fingal's Cave (Nursery winner off OR79) , Honest Bob's (Dual Seller winner allowed to be claimed by Channon. 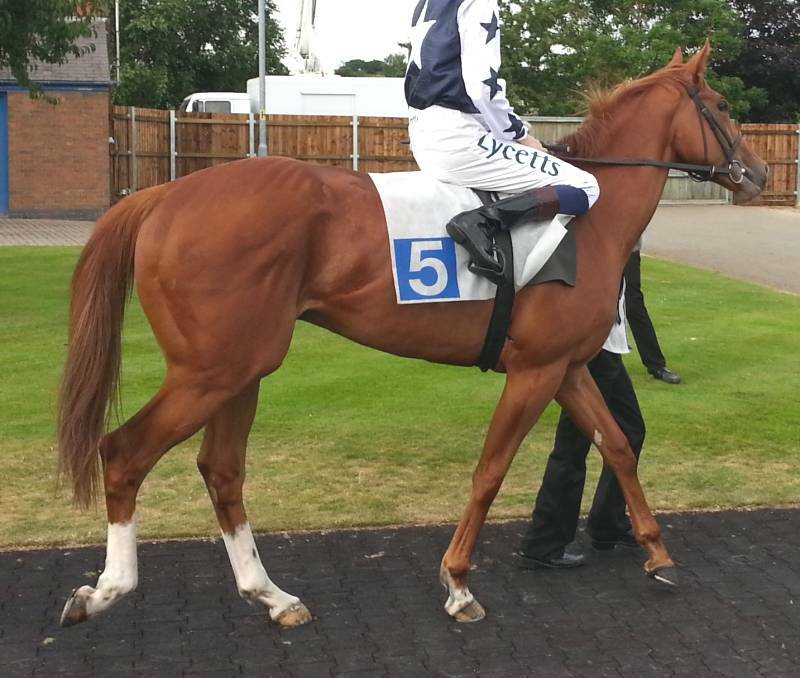 Got to OR85 for Brian Ellison ) & Pendlebury (Non-Runner on 29th May & still unraced ). The chestnut pair on the Left look a bit bigger than the Lead horse and go through the Gallop unpressured. Moonraker looks at least one size Bigger and Bulkier than Fingal's Cave. The two 2yos to the Right of the Lead horse look similar sizes and both smaller types. Moonraker seems to have been set the task of moving through from behind the others go to the lead late on in the Gallop. This seems to be a regular set-up for horses close to their debut and one useful task would be to check whether he only did it with the useful 2yos. Moonraker won at Ascot on his debut 4 days after this work and progressed through to lead too early and just hung on to prevail. Fingal's Cave goes clearly second best of the four 2yos and the rider is inactive to ensure Moonraker can get to the lead past Fingal's Cave and then follows that one comfortably enough. The riders on Honest Bob's and Pendlebury are pushing and shoving, plus shuffling the reins throughout and seem to be losing touch towards the finish. Some of that might be inexperience but they look less able racehorses and smaller types. One wrinkle to have been picked up is that Candy Morris seems to be valued highly by the Channon set-up and often rides the better 2yos in the Work Gallops. Fortunately she has long fair hair so we can tell she is on Moonraker in the Video. Look at the other riders and the guy on Honest Bob's is clearly still learning and not fully balanced. You can see his brain working as he switches his conscious mind from getting balanced then shuffling the reins, and so on. Does the least able rider get the worst 2yos to ride? How much is there to be learned from how strongly the 2yos finish the work off? As with the Bell set-up it doesn't look like there is any timing of the Gallop being undertaken. Having watched a lot more Channon Work Gallops than with Bell then a stage has been reached where there is some confidence in being able to judge some of what is going on. In this Video it looked clear that Moonraker would be a better 2yo and the way Fingal's Cave hung on to him that he should be usable OR70s, at least. The difference in relative bulk and power between those two is clear enough. You would say that Honest Bob's (HB) and Pendlebury went like sub-75 types and probably 60s, at best, if they wised up. The main question then is why would HB have been misjudged seeing as he got up to OR85? The first point to note in that is that he only won sellers and Channon let HB go for £15,000 so did not think he was anything like an OR80 horse. The flip side of that is that Channon has put some useful 2yos into sellers over the years including Monsieur Joe (OR100+ during a long career as an widely travelled sprinter). Probably split the difference and say HB is actually an OR70+ type who got over-rated by the handicapper. But, still a point to file away that the Channon Work Gallops fail to identify the ability of some of his 2yos correctly. But, come early May in 2015 you might well be quite confident you could spot which was the useful one if you saw a similar Work Video with unraced 2yos in. Further, how to rank the other 2yos on how they go relative to the good one and the sizes in comparison. You could then add in the knowledge that Channon tends to debut his best 2yos in early May (can leak into late April), and that only the best ones win FTO on ability rather than in weak races. Put all that together and spending some time looking at the Work Gallops from mid-April to try to spot the best juveniles he has looks like it would be time well spent. There are a number of other sources of Videos of Work Gallops but only occasional clips and not the fairly regular updates from Bell and Channon. In these one-off or occasional examples it is hard to begin to build up a knowledge of how the Works are set-up and what is going on. Do they carry any worthwhile information or would it be better ignoring such Visual data sources? Take this example of a short clip that Richard Fahey posted on Twitter on the 10th of January, 2015. Try looking at the Video below which shows Fahey, presumably, driving alongside a pair of horses working on an artificial surface strip. The 2yo of 2015 closest is un-named and by Pivotal ex Rag Top who cost €40,000 as a foal and then retained for 80,000gns as a yearling at the Tattersalls Book 2 October (TO2) sale. Why does Fahey bother tweeting such low quality Videos? Is their any motive or just keeping his Twitter account active? Should we go into 'Notebook' mode and watch out for when this one makes a debut? Maybe, this one is the apple-of-his-eye and he could not resist sharing his enthusiasm. Or perhaps he was trying out a new mobile phone or is working his way up to selling this one on. Probably best to just note he tweeted it and see what extra information comes to hand. Interesting to see that he is driving alongside the horse. Presumably he is another trainer who does not time anything on the Gallops but is he using the speedometer in the vehicle to get a feel who how fast the horses are going? He may be able to see, or ask the rider, how comfortably the horse goes at a particular speed. All interesting back information because Fahey seems a terrible judge of how well his 2yos perform on debut, and which is the best if he has 2 or 3 in one race. His comments in his regular section on the 'Sporting Life' website being mostly poor indicators of what to expect. The 2yo appears a compact body length and deep enough bodied and rolling along ok and balanced with the rider trying to hold him back a bit. His sire Pivotal has a good record with the 2yos that represent him but they do not tend to run in early season. This individual looks a smaller-medium 'Piv' body shape. The dam - Rag Top - won over 5f on her May 5th 2yo debut and Hannon managed to win an Irish Group 3 with her as a juvenile (worth about OR83-4 probably) and she did not win after her 2yo career. She has produced a moderate 2yo winner in Britain and a winner in Spain so far at stud. The 80,000gns bid suggest he ought to be a strong type but what size? Overall, interesting if this 2yo makes an early start because either he is small and has to win early and get an inflated OR to sell him or he might be useful. One for Paddock Review or if another video comes along. Something to track in 2015 and an example of how even a small, poor quality, Video clip may add some useful information. Even if that turns out to be not to take any notice of such Videos from Fahey. But, it does get the thoughts going about the upcoming 2yo season and starting to get the Profiling information in place. For example, knowing nothing else how would you value this Video evidence if the Pivotal 2yo turned up as the Fahey runner in the Brocklesby? An important question when reviewing Yearling Videos for 2yos is how much the average horse changes from late in its yearling season to being a 2yo? For example, you hear trainers saying that some of their 2yos change how they look "from week to week" as they grow and mature. With that background then looking at a Video from 6 months, or more, previously may seem of little value. One counter to that is that 'experts' pay large sums of money for yearlings so they must believe that you can judge to some extent what you will get for the outlay. If it is really a 'lottery' how the young horses develop we do not need experts because there is no skill worth applying. As is often the case the true answer is somewhere in between the extremes. A few yearlings do change markedly, for good or ill, physically from their yearling presentation. But, the vast majority vary only within a small range and a few very precocious ones will already be very close to their 2yo size and type. Having looked at a lot of yearling videos over the past 2-3 years the B2yoR take would be that you can tell a lot about what type of 2yo the horse may become. The Videos are also interesting in more general ways because you start to see what physical types trainers and their agents buy. If you also know a lot about how the trainer approaches the 2yo season you can start to see how those physical types interact with the trainer's MO. Perhaps a trainers acquires a lot of bulky yearlings (good) but they do not look that athletic in the Video (not good). If those types then turn out to be strong looking slow 2yos then you have learnt a very useful nugget to input into later race Profiling and Paddock Review. As a general RULE this author would say you should always prefer a Visual input for information about any horse, any time. There are a number of sources of yearling Videos on the Internet and we will take the example of Tom Dascombe. Partly because he is an important 2yo stable. He also provides good quality Yearling Videos on his Website of most of his 2yos which were bought at public sales. Another plus for a trainer B2yoR has long held in above average regard. One niggle has developed as his career progressed quickly from having a few cheaper horses and getting great results to being in charge of a big stable with high financial backing, Something seemed to change in the types of yearlings that were bought, physically and not just in price terms, and without the level of improvement in results expected. B2yoR's anecdotal take on that was Dascombe had less control over the purchases made. To put to the test the idea that Yearling Videos can be useful let us take 4 examples from the Dascombe website. One is of a 2yo from 2014 and reviewing it in 2015 is, of course, a monstrous bit of After-Timing. But, it sets a standard to then look at 3 example Videos already on the Dascombe website of juveniles of 2015 who have not yet raced. The Yearling Video below is from Autumn 2013 and for the 2yo of 2014 Joshua Potman. Have a look at the Video and what impression does it leave? Good or Bad? What type of 2yo might he be? And so on. The first impression was that it was a belting day for it, which we can all agree on. 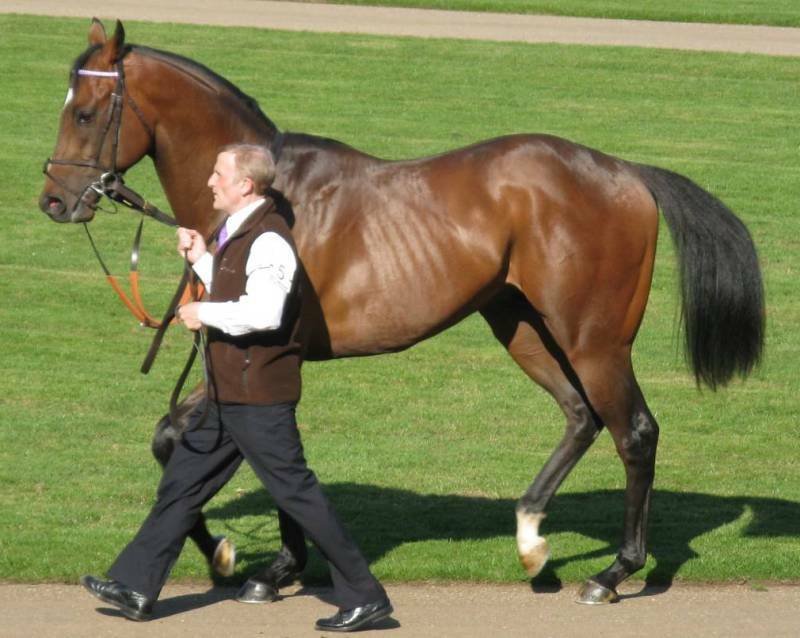 The two things that struck B2yoR back in 2014 (after time alert) was he was a good size and solidly built (good) but he did not move like a sprinter (niggle). Long stride at the walk and no 'snap' to his movement. He looks like he would need 7f+ at 2yo and you would want to see how he had developed. A real niggle that he might be a bigger but slow 2yo and perhaps better at 3yo. He is by the sire Zebedee who had his first 2yo runners in 2014 and the majority of wins were over 5-6f. As you would expect for a sire who only ran as a 2yo and over 5-6f with his most important success at the minimum distance. On reviewing the Video a mixed story and setting a framework to place any further information gained into. The next big bit of input about Joshua Potman in 2014 was that he made his debut over 7f in early July soon after the 7f races began. From which you could infer he was not a sprinter, as suspected, but was precocious enough to run early(ish). 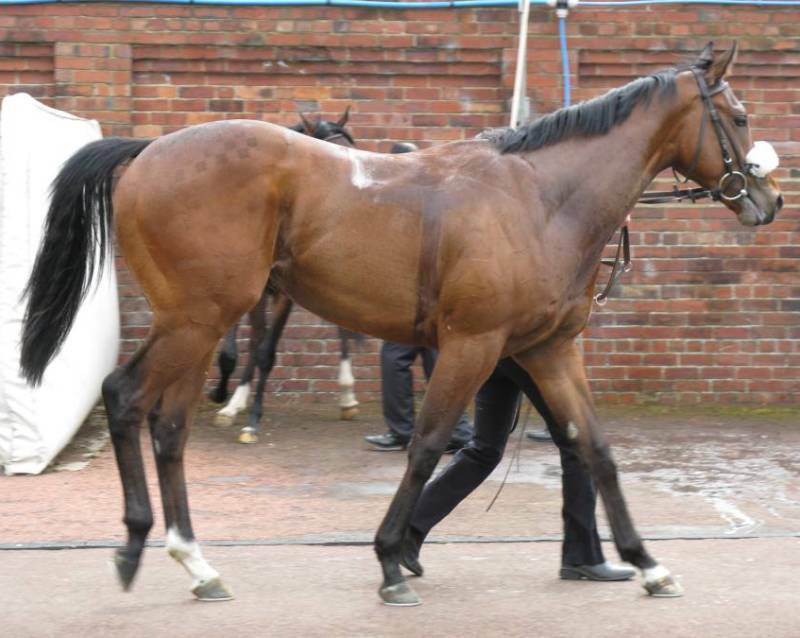 A complicating factor if you knew about Dascombe's MO was that he ran in a Novice race at Haydock first time. The trainer seems to use Haydock to start some of his best 2yos who can win on debut and had another two FTO wins there in 2014. But, Joshua Potman ran in a very strong race first time and got dusted off by previous winners and looking a bit cumbersome overall. As his Yearling Video hinted at. JP ran twice more at 2yo finishing 3rd in an 8f maiden on his last run. He has been given an OR63 to start his 3yo handicapping career and we could ponder over how competitive he should be given that. Looking at his size and bulk he should be powerful enough to get over OR70 and OR80+ if he develops well. The niggle is whether his movement is efficient enough and whether he will continue to look a bit slow as he goes up in race distance. Plus, will his stamina run out before he finds a Distance that suits his basic speed? We can check how that works out and however it does we will have learnt a lot by following one horse's career right from Yearling Video through to what the buyer got for his money. 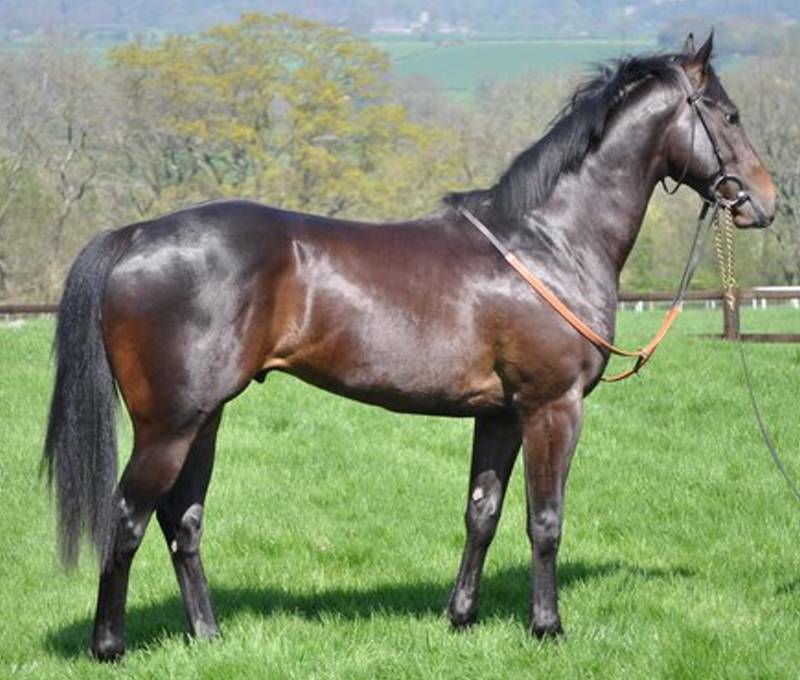 To complete this sub-Section are 3 Yearling Videos of Dascombe 2yos we should see in 2015. The first is named Our Elton (Speightstown ex Warsaw Ballet) and he cost €80,000 as a yearling at Goffs Orby Sale (their Premier sale) in Ireland. To put that price into some context the US based sire Speightstown has developed a very successful stud career and has a notably good record with his British raced 2yos. The Stud Fee for the Sire went up to $80,000 in 2013 having risen in stages from an initial $40,000 as general fee levels decreased. His average for all yearling sales in 2014 was higher than €80,000 which means Our Elton is 'below average' by some measures. If you think the Sire and the Sale he was at added something to his Price out of line with his physical type the a headline '€80,000' should be set aside. Look at the Video and what might you expect of Our Elton as a 2yo?. To the B2yoR eye he looks to fit somewhere in the Category of bulky enough but does he move well enough? Perhaps more a 7f debut type, unlike his sprinter sire, and he 'feels' like sub OR75 quality and not one 'to follow' positively. A less pleasing body shape than Joshua Potman and less range in the walk. Is the relatively short stride behind, compared to JP, because he does have some sprinter snap or is he unable to stretch out more? Surprised if he is an early debut although might start at 6f then step up. Which sets some 'Priors' for judging when more information comes along. Again, if he turns up in the Brocklesby the text above will need a rethink. But, even if it proves to be incorrect that is fine because the Video is then there to go back to to try to identify what was misjudged. Or, had Our Elton improved a lot from yearling presentation. Take the hit, get up, learn any lessons and move on. Do not protect yourself with piffle like 'Nice Type' and 'Good Bodied' vagueness. The final Example of Yearling Videos are a pair of Dascombe 2yos of 2015 to compare to each other. They cost similar amounts at the sales and both have sprint 2yo pedigrees with Reflektor's having '5f 2yo' stamped on it. Have a look at both Videos and how similar do you think the pair are? Which would you prefer to have for a full career if given the choice? Are these different types in terms of precocity, and other in other ways, to Our Elton? What size are they and where would you put their real upper 2yo ability level at, e.g. up to OR60, or OR70, or OR80 or higher? Both videos are a similar length and format so try setting both Videos running as close to simultaneously as you can. A bit of 'Video Virtual Paddock' and does seeing them in action together assist the Review? £45,00 yearling at DPY Sale. Dam a placed maiden and probably sub OR60 quality. Half brother to slow developing 2013 2yo Nova Champ who won in later December as a 2yo then 2 x wins at 3yo to get to OR80. Full brother to Listed 5f 2yo victress Bahamian Babe, 5f 2yo winner Victorian Bounty & placed 5f 2yo and 6f 3yo winner Ventura Cove). 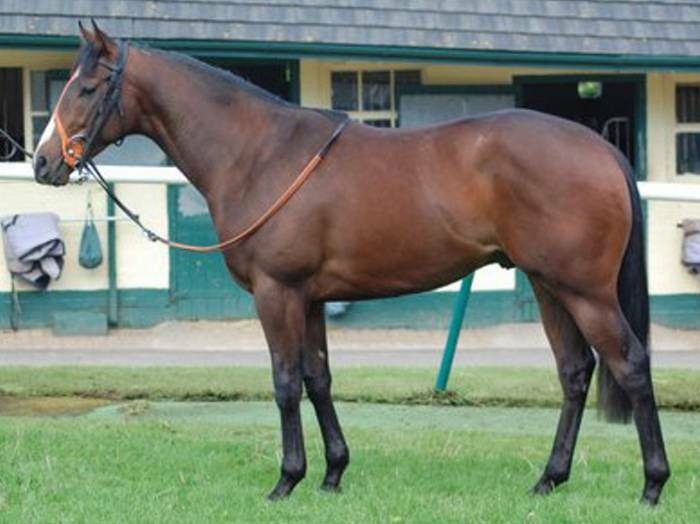 €50,000 yearling at the French Arqana August Sale in Deauville. Dam a placed 3-4yo in the US. By the Sale time she had produced 1 x winner fom 5 foals who was a 2-4yo winner in France and by the American sire by War Front. Without going into it fully they both look 'as advertised' to B2yoR and ready, early 2yos who move ok. Both look usable and compete fine in early season maidens but are they real long term OR75+? Given his 'Dascombe Shape', as opposed to the agents preference, the choice would be to take Swansway given the option. Again, we can see how that develops in 2015 and how much information there was of value in the Yearling Videos. To complete the 'Visuals' Section some examples of the use of static images in pre-race Profiling. As the saying goes, 'a picture is worth a thousand words (or numbers)' and combining the Pictures with sensible, proven valuable, Numbers will improve the Virtual Model being built of the race. The example below shows two 2yos of 2015 which made their debuts in the same Nottingham Maiden. Before the race @B2yoR tweeted an image of the two yearling pictures side-by-side and asking which one of the pair looked better value for money and which would perform better first time. If you look at the two Yearling pictures it would be impossible for anyone to explain why Wickhambrook cost more than 7 times the amount Extortionist did. To explain it you would have to wade out into a 'Field of Noise' and talk abut pedigrees, what a good sire Dubawi is, etc. 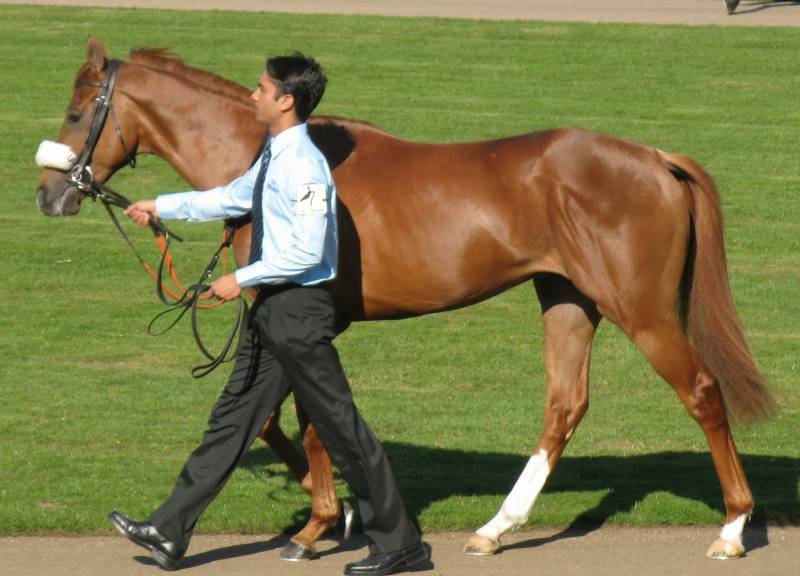 All meaningless if you look at the underpowered, non-Dubawi typical, Yearling that Wickhambrook appears. 210,000gns?? Are we all looking at the same horse? 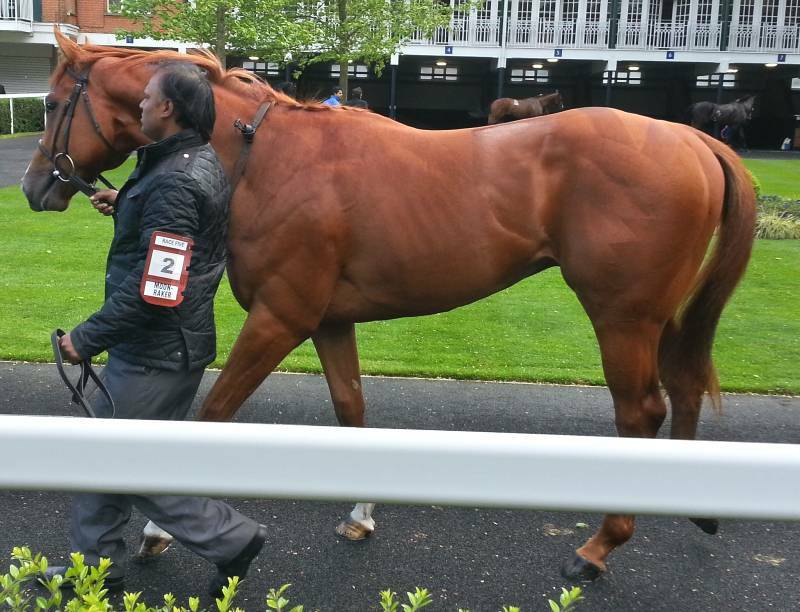 The pictures below the yearling ones show how the two horses looked in Paddock Review for debut. Again, anyone could look at the pictures and say which was the bigger and more powerful athlete. The niggle with Extortionist would be he was a bit too up-for-it. Based just on the Yearling pictures the Paddock Reviewer at Nottingham was tasked with checking that opposing Wickhambrook & supporting Extortionist would be a good idea. Which was an easy call. Wickhambrook was backed down to 5/2f and finished 5th while Extortionist won comfortably backed to 100/30 and was successful later at Royal Ascot. To complete the story Wickhambrook was demoted from the Godolphin team soon after and eventually won a Wolverhampton maiden for another trainer on his 6th start. He has not won since and finished his 3yo season getting thumped off OR73. Which sounds about right looking at the Yearling picture. While this is clearly a carefully chosen example to make a point. The fact remains that if the only Visual you have is a Yearling Picture then still spend time to collect and review it. There are often useful clues to be found. A solid number of trainers make pictures available of their juvenile as 2yos which means you can see them at a later stage of development than as yearlings. They also usually have the advantage of the pictures being taken in a similar location for a range of horses which means you can build up knowledge of external clues to the size of the horse. The similar picture types also aids in being able to spot physical types that the trainer acquires. The 4 pictures below are examples of the types of pictures available. Seller winner, well beaten off OR59 last run. Placed Maiden, well beaten off OR71 last run. Maiden winner, well beaten off OR85 last run. Unplaced Maiden, well beaten off OR55 last run. The Top Left picture is typically of an Anne Duffield website 2yo picture and she tends to take them out in a field. Black Pudding looks an odd physical type in being narrow bodied and the body too long. He looks like a 'sideboard'. Go searching for positives and he is standing balanced, has some power behind and looks a mature personality. But to runs into the 50s and win a seller would be an above average result looking at the picture. You might counter by saying that the Number £8,000 told you that. Unfortunately, Sales Price has a limited correlation with the ability you get for you money. Karl Burke got Group winner Toocoolforschool for £16,000 as a 2yo and dual winner Felix Leiter (OR88 season end) for €16,000 in 2014 as counter examples. The Top Right picture from Ed Dunlop's website makes B2yoR cringe. Looking at the picture before Beach Samba's debut it seemed easy to dismiss him as a smaller one and over-priced at €75,000. He then belted along in the lead on his debut and finished 4th tiring late and he got upgraded to perhaps being an OR80 one. His subsequent runs proving painful as the evidence showed the 2yo Picture Review was right. The Bottom Right picture shows a typical picture from Stan Moore's website. Mr Moore tends to but horses with some bulk but often with odd shapes and partly because he has a smaller budget to spend. The picture of Indian Joe looks a neat enough 2yo with some bulk. But having seen a lot of these pictures with that same rail in the background the alarm bell starts to go in Reviewing it. Is this a (too) small one being the question for the Paddock Reviewer. The Bottom Left picture shows a typical Mark Johnston website picture. A different set-up with the horses shown working in very early year and not posed. This makes it interesting to study the Pictures and try to assess what extra information the horse-in-motion provides. For Example, look act Chadic's forelegs and think about how much range he has, and is using, and whether he looks a snappy sprinter overall or a galloper. Having gorged on Visual input in the last Section we now turn to think about Numbers as the input. In the last Section if you did not follow what was going on you could, at least, enjoy the secenery. None of that here and you had better get used to a diet of Numbers. The specific example for consideration are Sectional Times with a mild detour into Sectional Positions (or Halfway to Final Positions in B2yoR land). Sectional Times, remember, have flirted with becoming regularly available in various forms at times over roughly the last 15 years. We currently have a situation where the company Turftrax are being paid by Qipco (Qatar based sponsors) to provide Sectional Time data for the whole of the 'Champions Series' of Group races in Britain. Turftrax are also paid by Arena Group (Racecourses owned include, Lingfield, Southwell & Wolverhampton) and the BHA (presumably via the BH Grant Scheme) to provide Sectional Times for the 2014-15 Winter 'AW Championship'. Looking on the Turftrax Website on January 15th showed only the Lingfield AW Sectional Times being made available over the Winter. The page says that a range of other courses, turf and AW and including all the other AW tracks other than the recently re-opened Chelmsford City (aka Great Leighs), are their clients. The Turftrax webpage linked too gives an overview of the technology used to take Sectional Times and gives examples of other Data available to them which is not part of the information they provide under the sponsorship deals noted. In the absence of any automated provision of Sectional Times those wishing to produce Sectional Times in Britain have had to fall back onto the British 'Men in Sheds' approach. Which requires doing the best you can to time each horse in a regular 2f or 3f section of races by watching the race Video with a time counter on-screen. This relies on a standard position of a Camera on a course to define a point to start the timings. This is something to be wary of accepting. To B2yoR's knowledge, for example, the '3f Out' side-on camera on Nottingham's home straight can vary in position by up to 50yds, depending where the driver/camera operator parks the van and which way they string the power cable back to the power socket. In the case of B2yoR the Halfway-Final Position data has required much 'shedding' and stopping races somewhere around halfway to take the positions at that point along with related, visual, data. One advantage this has over taking times is that a 50yds difference is not that important because most British races go through a Mid-Race lull after early positions have been established. It is unusual for much to change in terms of 'Halfway' Positions from after the first 1f has been completed until the race kicks off with the final efforts going at 2f from the finishing line. With that introduction let us turn to a real example. Below is a picture showing the Sectional Time/Position data that Turftrax are currently providing for all Lingfield AW Flat races over the 2014-15 Winter. Although this is shown as a static picture it is actually a spreadsheet which you can load into your preferred application to manipulate further. For example, probably the best/first thing to do is export the data out of the spreadsheet and load it into a properly constructed Database. Then the figures are available to do some proper longer term comparative analysis and not just looking at one event. The example race was a 7f Class 2 handicap for fillies with 8 runners. Stosur was reportedly tailed off and pulled up but records a last 1f time less than 2 seconds behind some of the others, which is slightly troubling. If you are not a seasoned Sectional Time user ('Sectionalista') who has spent a lot of time creating and reviewing such data then how much useful information are you able to glean from looking at the table above? For B2yoR the usual 'Pile of Numbers' feeling returns even having experience thinking about Race Dynamics and watched thousands of Race Videos. What difference does it make running 11.14s rather than 11.31s in the 4th furlong of the race? What does the 0.17s difference amount to in visual distance and in relative speed? What speed in miles per hour (MPH) do these times equate to? How fast are these times compared to some set average? What were the conditions like on the Day? And so the questions go on. Now, some of this Pile-Of-Numbers response just represents a lack of experience. Somebody who has not spent 'enough' time looking through the data to get a real feel for it. But, some of the issue seems to be more fundamental than that. There is a Mental Model missing against which the figures can be compared and the presentation of the figures as this spreadsheet does nothing to assist acquiring the Model. There is some intuitive, part Visual, understanding not available. To take very simple example, you do not have to be an expert in 'Mountains' to have a Mental Model to put Numbers like 5,000 feet high compared to 25,000 feet into. If the Numbers then start adding detail like the steepness of the various sides as Numbers presented as Angles your Visual model can be updated and refined. 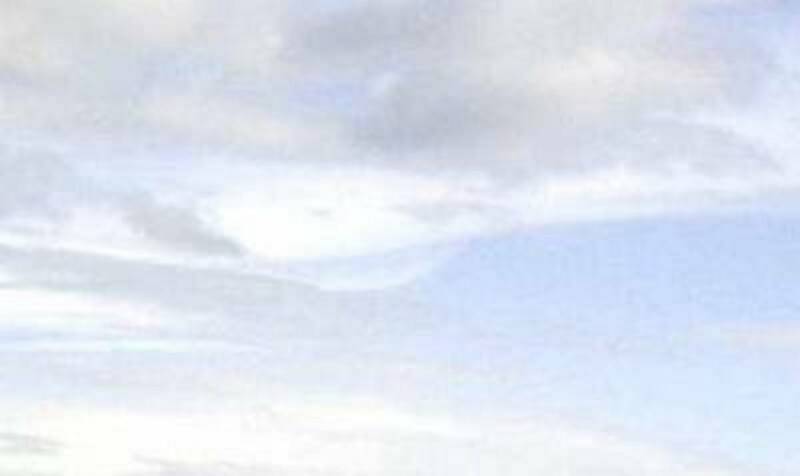 You have a known range of how high Mountains are and the faces they present. Even with a part abstract Number like a 'Strike Rate' (the wins to runs percentage) you can intuitively feel the difference between a 5% Strike Rate and a 25% one. Whether that be because you visualise completed sections of some whole (100%) or leave it part abstract and just respond to the 'weight' you feel from the figures. The 1f Sections should be more clearly labelled rather than leaving an ambiguity over whether '3f' means '4f to 3f out' or '3f to 2f out'. The main Number that should be presented in each cell should be the Cumulative Time the horse has taken to reach that point and not the time it took to do the last 1f. A major point being that we should have the Final Time each horse took to run the whole race visible. The time the horse took to do an individual 1f should be presented as a subsidiary figure to the Cumulative Time. Perhaps as a superscript figure. How far behind the Best Cumulative Time each horse is at each 1f checkpoint should be made visible. Both of the previous bullet-pointed Times should be Colour Coded in some way to start the process of bringing some Life & Visualisation to these Figures. The alternatives for Colour Coding are endless. Make all the Colour Codes 'Race Internal' and percentages of the winner/fastest to that point, for example. Or, they could be against the known distribution of such times in the Historical Archive. Perhaps, as amended by Race Class and environmental conditions on the day. Display the Topology of the 7f Course at Lingfield along the Top Axis where the Furlong Marker Titles are. Surely it makes sense to let people know Visually that the first 2f are Uphill to some extent then there is a sharp downhill and the last 1.5f+ are flat. Display the Bends in some way Visually. The near Right-Angle turn after 2f out needs noting on the Spreadsheet. Display the Prevailing Wind and Strength on the Day. Show the Direction it was relative to the Direction the Field was running in each 1f. Display the Speed (MPH) figures for the Leader Overall in some way. For example, have a Line Graph where there is a Baseline Figure Line on calculated from the Historical Archive and the Actual Plot of Speed with Time in this Race. Display a Line Graph showing the Speed with Time variation for each horse. Allowing comparisons, in a Visual way of how the horses ran the 7f. Since the Turftrax options allow for Plan View Visualisations for where each horse was at every point in the race then, as a minimum, make this available as a Picture for each 1f checkpoint. Give everybody a chance to build up a Mental Model of what difference 0.2s in 1f actually means in the Real World. Time to call ENOUGH to the rant although there are plenty more ideas available if anyone wants them. The Top Level issue is that the Data being made Available should have more pre-processing done and more thought into the presentation. Currently the Data is just fodder for a certain set of 'Men in Sheds' to go away and cobble together, err craft, whatever rickety solutions they can using their favourite tools. The Base data presented should be of a higher quality and more User Friendly and let the Shed-Heads add some real value instead. To move the Sectional Time thinking forward let us look at one example of how the Base Data is processed to produce summary Data. The approach chosen is from Simon Rowlands who is currently the 'Head on International Research & Design' at Timeform. Which is housed in a Big Shed in Halifax with lots of, similar, men in it. From his, voluminous, Twitter output he would count as a Chief Sectionalista in Britain. He also has to be credited with writing about Sectional Time analysis and making his thoughts available. That is probably 'at present' since his job entails turning data sources into Product that can be sold by Timeform or used in some way to promote their cause. 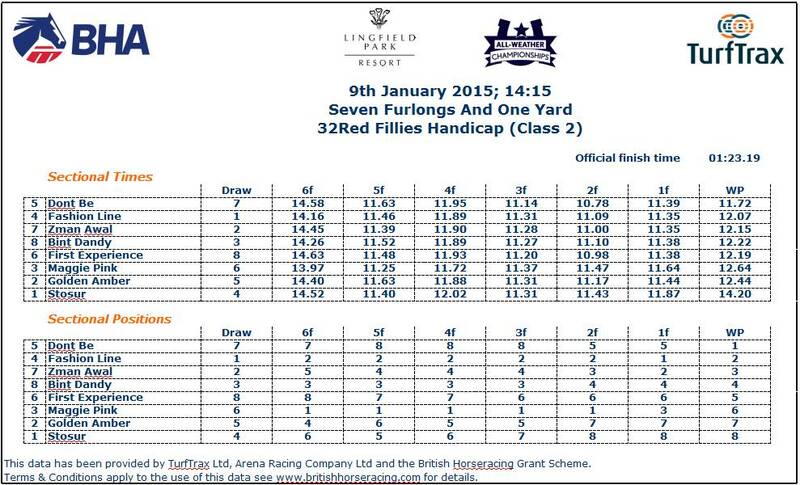 Below is an example of his summary of one day's races at Lingfield that he regularly produces. He can produce these by taking the equivalent spreadsheets as shown above for each of the races and processing them using his preferred method. Mr Rowland has been producing these reports for some time and before the date when Turftrax made some available. For these he presumably used the labour intensive method of estimating times for each horse in a race while working through the Video pictures. Always hoping the Camera positions were in a Standard place to allow some chance of recording a reasonably correct time. Average Seconds per 1f for the last 2f = 23.07/2 = 11.535 secs/fur. Average Seconds per 1f for the whole 8f race = 99.64/8 = 12.455 secs/fur. The next step for Rowlands is to use the Final 2f Time for the race, in light of the overall pace to compute a 'Sectional Time Figure' for the race Winner, which is in the last column. These appear to be close to OR ranges and Johnny Splash ran off OR65 for his win that day and got a 63 Sectional Rating suggesting he had nothing in hand and the race played out well for him. He has been beaten twice since off OR70 & 71. Rowland appeared more upbeat about Jack Of Diamonds' effort and the 99 Sectional Rating compared to an OR81 he ran off but was not noted as a horse 'To Follow'. He has been beaten twice since off OR85 which needs some thinking about. Caminel ran off OR61 and Rowlands said - "..seemed to do remarkably well to run down her rivals having got outpaced on the home turn (ran third-last furlong slowest in entire field) but has been less than reliable to date.". Caminel has not run again when this article was written. The Optimal Finishing Speed for the Course & Distance which is worked out by looking back through the Historical Timings. 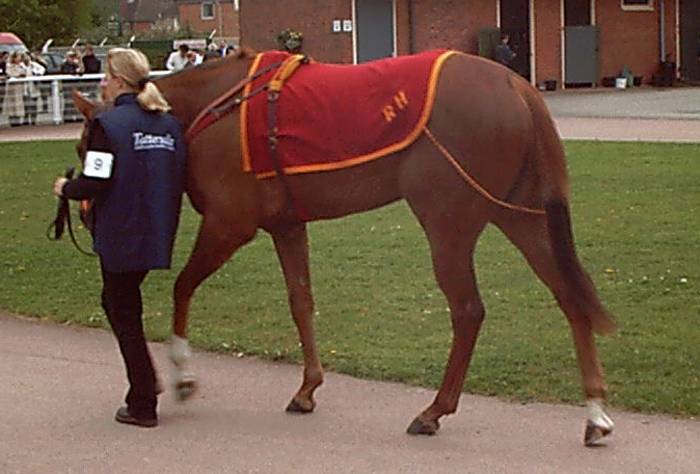 A Constant Figure for which 1.25 is used in his explanation using Hawk Wing's power packed finish to be second in the 2,000 Guineas in 2002, courtesy of a less than good ride by Spencer (before he was sacked). It is not clear from the explanation how the 1.25 Constant is derived not whether it is Course & Distance specific or general. At the bottom of the Sectional Time spreadsheet from Turftrax is a second Table which gives the 'Sectional Positions'. Not that technical and just a listing of the Positions of the horses at each furlong point. An initial response might be what is the use of that? Below are the Sectional Positions for the example race and below it the typical printed Result for the race including the 'Comments in Running' (CIRs). Partly for general reference but also to use as an example of how the CIRs match up to the Sectional Positions. A couple of examples of how the CIRs raise questions about whether the Sectional Positions are missing some useful extra information. The CIR for Maggie Pink who blasted off in the lead said she was in a clear lead until the turn into the Home Straight. A question is how far clear and how much did she stall and fade and how much, and how early, the others made ground back on her. The Sectional Times answer some of those questions but in a non-visual way and need to be turned into Cumulative Times to produce the 'How Far Clear?' figure. Looking at the CIR for the winner Don't Be it says she was held in rear but how far back was that in lengths? The CIR then suggests she started making her forward move towards the last 2f. If you look at the Sectional Times carefully Don't Be started her forward effort 4f out from the finish on the start of the main downhill run. She was in the fastest 3 Sectional Furlong Times for each of the last 4f of the race. The distance back from the leader each horse is judged to be. In 'Visual Lengths' and not in fractions of a second. This builds up the Visual knowledge of how far back horses can come from to win a race at different race paces. Enabling a person to build up a knowledge of how to 'Read' a race and also assist in spotting horses who make more ground than would be expected and how they do it. The second point of spotting horses running 'Better than the Result' (BTR) being a visual version of the 'Sectional Time Mark Up' that fall out of Simon Rowlands' equations. But, done in a visual way that encourages someone to go back and look at the Video to see how the horse achieved it. The 'Lane' a horse is running in. If the Halfway Point is around a Bend this is either on the Rail (Lane 0) or how ever many horses/lanes wide of the Rail. On the many Straight Courses the 'Lane' is from 1-30 from one rail to the other (sometimes 1-50) on very wide courses like Ascot & Newmarket. Recording the Rail will highlight how much of a disadvantage running the rail was, or was not. It might also highlight a 'Dead Rail' where running wide was an advantage. On Straight courses the fields often Fan Out across it and may run in different Groups. If you look at the Lanes run in for big fields in the final Result the Lanes Run distribution will often highlight possible biases in Track Position run. For example, the regular one-side 'swamps' at Newbury. The use of Lanes also overcomes the issue of trusting to Draws to tell you where a horse ran. On wide courses many horses migrate to other strips and the Draw is plain misleading. Sectional Times/Positions are not able to identify such matters. The following link goes to a sample B2yoR result which displays some of this extra information. The 'LBL' column shows the Lengths Behind the Leader the horse was at Halfway. The 'LB' column is the Lengths Beaten at the finish. The Difference between the two can be used to highlight horses making unusual moves in the second half of the race, for example. The 'Hf' column gives the horse's Sectional Position at Halfway. Those coloured Green are horse who made places after Halfway, this is again a more Visual way to identify unusual 'Closers' than looking at fractions of seconds in a set of Sectional Times. The 'Shape' of the Halfway positions to Final Placings will often tell a lot of the Story on the Race Pace and how it was run. For example, at the extremes, a Slow Pace assisting prominent racers will often show up because the leading Halfway Positions are still in the first 3-4 places at the finish, with minor shuffles. In those races a 'Deep Closer' getting into the prominent racers at the finish will show up because of the Halfway Place change. A Visual hint to look at that runner again in the Race Replay. In a 'Pace War' race the low numbered Halfway positions will be at the rear of the field at the finish and the high Halfway numbers clumped at the Front. To summarise, the Sectional Positions data Turftrax provides is both a terrible tease and a failure to provide punters with the really useful information they need. Supplying a few extra numbers with some minor Visual highlights would be hugely beneficial. As a more general point the available Sectional Time and Position data can be used to get at information about how individual horse's performed plus some insight into the race as a whole (the Race Pace). What both fail to do in the forms implemented at present is to expose the way races 'Flow And Fold', their internal structure. How the different ranks of horses in a field through Halfway stall and fade in order depending upon the pace and how that appears in the Race Videos. For example, try looking at the 'Closers' in Wide Track in the Home Straight at Lingfield. Those endless races at the course where something coming wide and late picks off a horse running to it's left late on. How much of that visual effect is (a) A superior horse finishing unusually well? ; (b) A 'Concrete Strip' in the Centre of the Home straight where the 'crown' of the synthetic surface's hard base is less deeply covered? (c) Just the typical rolling 'Flow & Fold' of a field as the pace set makes the ranks of horses stall and fade in order? If Turftrax and their sponsors could give us improved Sectional Position & Track Position data we could finally sort that conundrum out. Sectional Times alone are not THE answer. The last two Sections have been Surveys of some types of Visuals and Numbers information that are available, while looking at examples of how they might be used. In the Introduction it was noted that Race Analysis may well be done best when a person can combine what both Visual and Numerical data can offer. Let us take an example to see what this amounts to in terms of available information in an example from outside Britain. Hong Kong is a good choice because the set-up of racing there allows a lot of the practical & funding issues which hamper progress in Britain to be solved. You would also surmise that the pressure from the customer (the HK Punters) to gain access to the information is also more vocal and is actively listened to by the Racing Administrators. The chosen example race was a Grade 2 event over 1,200 metres (approx 6f) at Sha Tin racecourse on 23rd November, 2014. The race was run on Turf with the Going stated as Good-to-Firm. The winner of the race was ex-British raced 2yo Peniaphobia who was presumably sold to race in HK after winning the Supersprint at Newbury on July 20th, 2013. The Hong Kong Jockey Club's website makes large amounts of information available on racing there including a range of types we never have in Britain. For example, you can find out what Peniaphobia (branded as S143 in HK) has been doing on most days since he arrived in HK in 2013 in his Trackwork Records. Wouldn't it be good to be able to see that Trackwork so we had some Visual clues as to what condition Peniaphobia is in on any day and how he is moving? This is Hong Kong, so you can. Follow this link to get to the Trackwork Video Archive. Scroll down to the Dates Listing to the right and choose "10/01" and then click on "A S Cruz" because you want to view the Trackwork for horses Tony Cruz trains. Peniaphobia is at the end of the Video but seeing the other horses before him gives a lot of general information points. And there is more. HK has 'Barrier Trials' which seem to be, excuse the British ignorance here, full field Work Gallops with horses from different trainers in. The horses run the full race distance and start from stalls but the riders are not fully kitted out as jockeys and they appear to be able to treat the race as 'Work' and ride to the training agenda requirements. For example, this Barrier Trial Video Page is from the 13th of January, 2015. If you open that Page the 'result' for the 'Batch 1 Barrier Trial' that included Peniaphobia is at the top. Press on the 'Barrier Trials Video' icon below the Batch 1 Title and you can watch Peniaphobia (widest Draw, Yellow with Red Cap) steaming off to lead and 'winning' while doing a bit of Choisir-style nodding. With all this information available how often would you actually need to leave your house? We didn't see this much of Peniaphobia when he was trained in Britain. The picture on the Left above show Peniaphobia after his debut win on May 1st at Pontefract. The main point that always strikes B2yoR looking at the image is how balanced and 'complete' he looks at that early stage. After that FTO win assistant trainer Robin Ryan looked as smug and triumphant as it is possible to be without actually running around the Winners' Enclosure clicking heels and shouting "High FIVE, Dude". A man who had seen his opinion vindicated. The picture on the right shows the horse before a race in HK. The changes with extra development seem to be he looks a bit rangier and possibly lengthier but with the same body shape. His range in front and balanced nodding seeming to show up in the Work Videos - when he is not throwing his head and arguing with the rider. You wonder 'Why?' Fahey and the owner sold him on after the Supersprint. 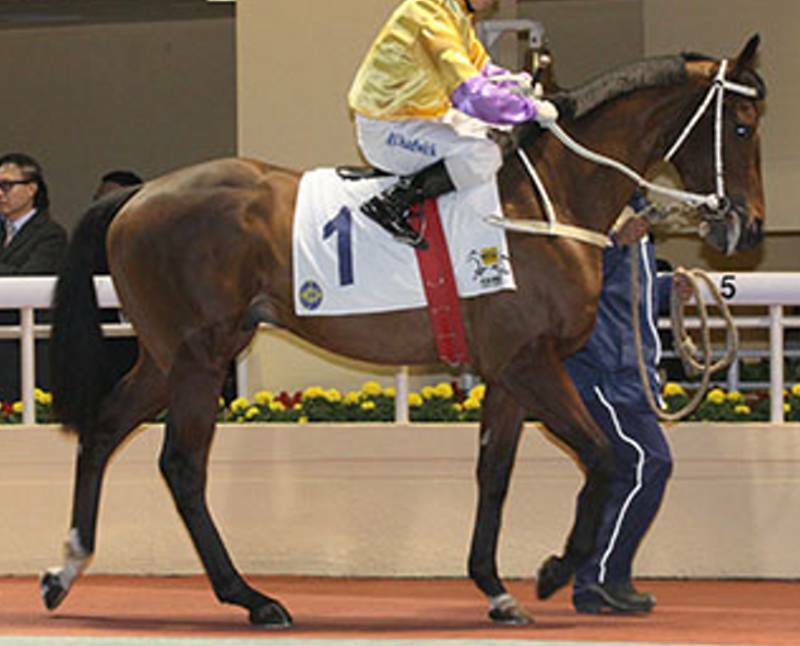 Peniaphobia has won more than £1,000,000 in HK already and his rating has risen from 103 to 123. Surely it was worth hanging onto him longer as a 2yo and running in Group races. Then getting a bigger price from the HK buyers or deciding he was worth more kept in Britain to try to turn him into a Stallion prospect. Instead, he is a gelding in HK and able to add multiple Millions more pounds to his winnings if he stays sound and has a long racing career. Here is the Link to the Standard Video Replay of the Race. This is very good picture quality. The Standard Video Link also provides options to see the race from different Camera Angles as the 'Patrol Replay' & the 'Leading Horse' tracking cameras. For major races they also provide a Virtual Overhead Video Replay of the Race. This is the equivalent to the 'Race Visualisation' service which Turftrax can provide in Britain if they can find anyone to pay for transmitting it. Note that the 'Overhead' part starts after a few seconds into the race and is on a split screen with a normal race replay. One point to note is how well Peniaphobia breaks from the widest stall and then is allowed to drift back to Midfield. Video Replay of what HK terms the 'Pass Through' part of the race in this Video Replay. This shows the whole field finishing the race and then pulling up around the long bend. In the US this is probably called the 'Run Out' and in Britain the horses 'Pulling Up'. Except in Britain we place next to zero value in seeing the 'Pass Through'. The live camera work after the finish in Britain will show a close up of the winner and often just of the jockey with the horse barely visible. What are we missing out on in ignoring this 'extra' part of the Race Analysis? The picture following shows how the Sectional Times are presented in HK. Note that the Picture is truncated so that the 11th to 14th finishers are not visible. If you look to the bottom you will see two other useful British 2yos who were sold on early in Charles The Great (another Supersprint Winner) and Frederick Engels (Group 2 July Stakes victor before the sale). The HK approach to displaying Sectional Times addresses some of the improvements suggested in Section 3.1 above. They do show the Sectional Positions with the Time and also how far back from the leader the horse is in Lengths. For example you can easily compare the first two home and see that Peniaphobia gained 0.75L on Smart Volatility in the middle 2f of the race while running it 0.12s faster. Smart Volatility then pulled the same 0.75L back in the final 2F while running it 0.09s faster. Which means you can start to get some Visual feel for the power output and size of gains/losses. It also provides the Final Time for each horse without requiring the User of compute it. But, it fails to meet the high standards that the presentation could be pressed towards. The first problem is that they use 2f sectionals to split the race up rather than each 1f. 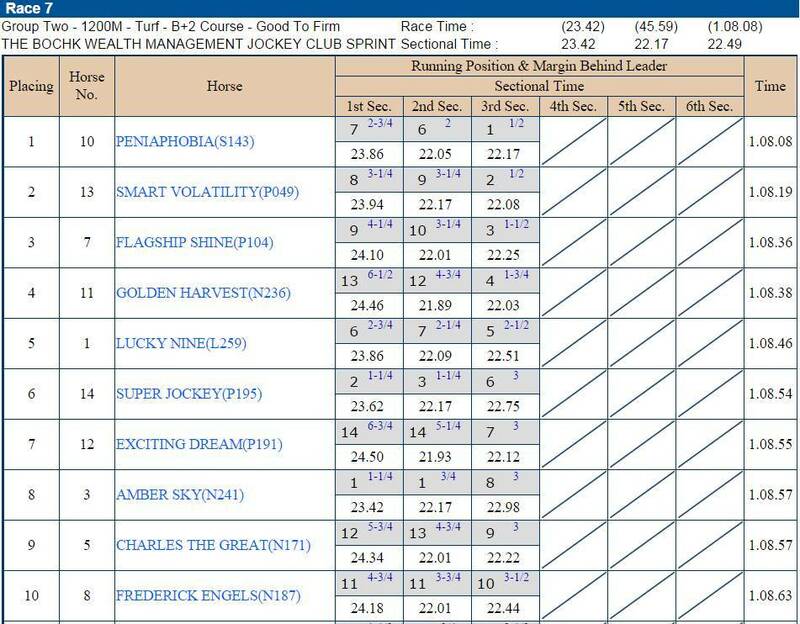 For example, look at the way Frederick Engels runs the first 2f of the race (Dark Blue with Red Details from Stall 5). He makes a poor Start and is last early on and drops to the Rail. In the second 1f of the race he then makes a forward move on the rail before getting chopped back on the turn to the straight. We need the 24.18s he took to run the first 2f split down to see how big the second 1f effort was. As an aside does he get blocked in the last 2f or is that all the effort FE can raise? But, an inefficient Race Style overall. Look down the list of improvements and we have no MPH Speeds, Bend & Wind Direction indicators, Colour Codings, Line Graphs to compare this Race Power Output to the Historical Archive, and so on. But, better than we have in Britain and supported by a range of vastly superior information sources. Since we have the Final 2f Sectional Times we can try applying Rowlands' method covered in Section 3.2 to see what Figures we get. Rowlands uses the Time The leader went through the 2f mark and the Time the Winner passed the Post to Compute the the 'Final 2F Section' for the Overall Race calculation. Which gives us (68.08s - 44.59s) = 23.49s as the 'relayed' time for the last 2f. The Finishing Speed for the race is then the 11.35s/200m for the Full Race divided by the 11.75s/200m for the last 200m = 96.6%. Which would suggest the Pace was too strong and if you look at the Sectional Positions of the first 4 home after 2f had been run then they were 7th-9th and 13th. That sounds like a 'Pace War' which enabled Deep Closers to get to the lead in the last 100m. 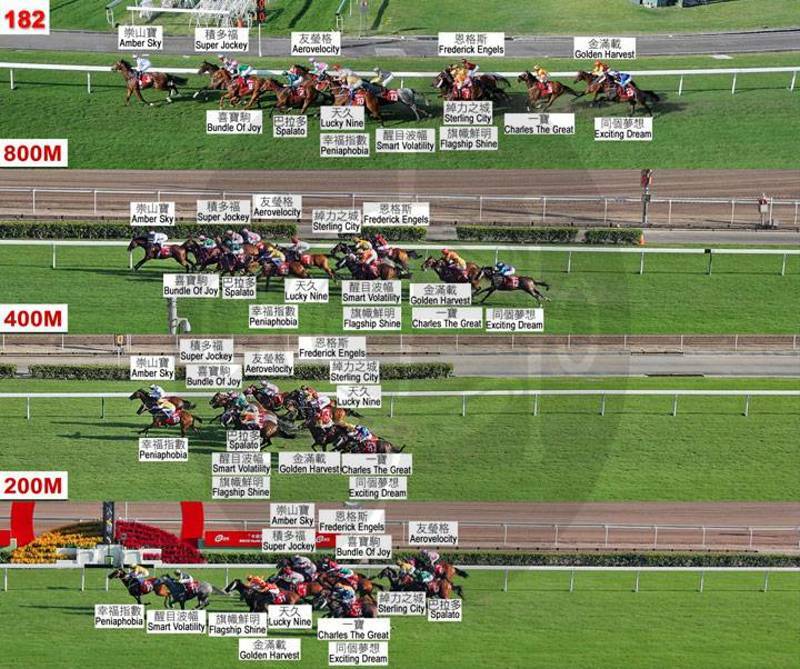 You could add in that those Closers managed that while mostly running Wide on the Bend and covering some extra Distance (figures which HK probably has via Trakus but this author was unable to find them on the HKJC website). If we press the, currently shaky, understanding of Rowlands' method a bit futher then what Sectional Mark-ups do we get for the winner Peniaphobia and 4th finisher Golden Harvest? Making two assumptions (on no foundations) that we can use 100% as the 'Balanced Pace & Most Efficient' way to run 6f on this track and that 1.25 is still valid as the Constant in his main equation. 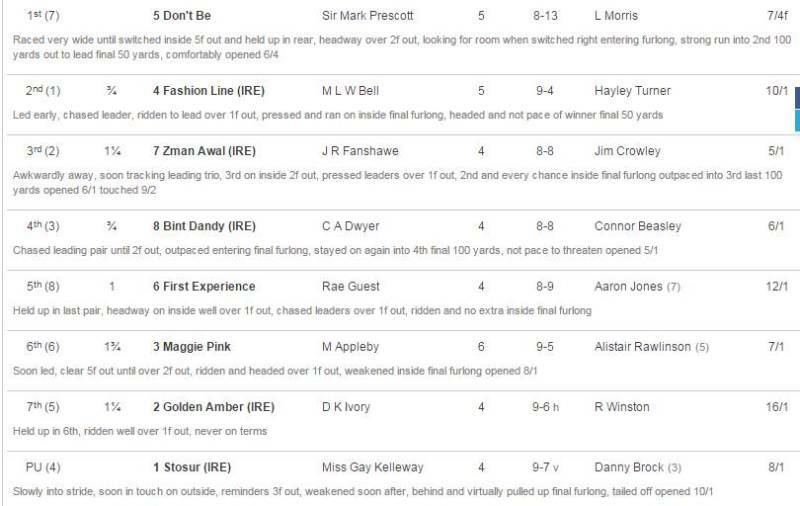 The figures this author got to were a mark-up of 5.6 for Peniaphobia and 7.0 for Golden Harvest which are compared to the overall race rating compared to the Final Time the winner ran. (If a Sectionalista wants to check and correct those calculations and point out any errors then feel free to do so. This is 'Work in Progress' for the author). Which you suspect would mean that Golden Harvest would get some sort of 'honourable mention' at least if someone were writing a Sectional Time summary of the race. Even if he was not made a 'Horse to Follow'. An interesting point is that both the Sectional Position changes (Golden Harvest made most places in the race from 13th after 200m run to 4th at the line) and the ground gained as 4.75L from after 200m to the finish flag up Golden Harvest's run as well. This means you would already have been alerted to Golden Harvest running well, without him ever really being in the race, and not doing more than some minor arithmetic in you head (13-4 = 9 places made). He also ran both of the Middle and last 400m Sections fastest of any horses just checking through the Table as presented. Without using Section Times if B2yoR found a horse making unusual Places/Ground after Halfway in a British 2yo race would be to go back to the Video Replay to see what was going on. Golden Harvest drifts back from the break and ends up 13th and on the rail after 400m and behind Frederick Engels who had overtaken him in the second 200m. GH the gets caught in a pocket on the turn to the Home Straight then angles out. He ends up on the back of the three wide runners who were 7-9th at Halfway and makes some minor progress on them in the last 100m. Trying hard to the line. A good effort visually but not startling different from the 3 he was chasing from into the last 200m. Finally, to a Visual presentation of Sectional Positions that HK provides to punters which B2yoR is very envious of. If only we had something similar in Britain. How much time and effort it would save people who Shed-Craft their own Sectional Position Data. Then you remember that the French Racing newspaper - Paris Turf - has been printing versions of these since the 1970s, originally in black-and-white and well before Digital Photography made the process childs' play. Again, in Britain we have never got started with this type of Visual tool. The picture below shows the positions of the field 800m, 400m & 200m from the finish and then on the Finish Line. The overall picture is a terrific summary of how the Race 'Flowed and Folded' and without ever touching a Number, all Visual. To this author's eyes it looks like a Classic example of a too-Fast Pace where the various Ranks of the field Fade in order. Try splitting the field into 'waves' of horses and see how certain Groups fade, or move relatively forward, together. The internal Struture of the race as a Visual and the first 3 home being 7-9th placed 'wave' at Halfway not a coincidence. In such races around a bend the prominent racers will have been Close to the Rail so you end up with the Classic Visual Clue of the Final Wave of Closers getting to the lead late doing so Wide on the Track. That is where the space is to make the move and not because of any track bias. The Fading prominent Racers present a 'Roadblock Going Backwards' which will hinder, or plain stop, any horse trying to make ground there (Fred Engels for example). If Golden Harvest had another 100m would he have Closed up more or was his wave starting to break? Once you have this Visual Mental Model of how races 'Flow & Fold' then these type of combined Pictures are terrific 'Stories' to be read. Beautiful. A Test where it is more important to honestly come to your own conclusions rather that worrying about being Right/Wrong. The Test is based on looking at 5 Breeze Videos and then undertaking some simple tasks based on what you feel you saw. Remember that the B2yoR work to assess these videos are in the early stages. Also, that the prices paid at the sales by various 'Experts' show a very loose correlation to what quality of 2yo you actually get for the money. This is an area where 'Right' only gets judged properly after the horses have run and built a career. Before that, one person's view is as good as anyone else's. The aim is to improve that situation. In the Table below you will find 5 embedded Breeze Videos (in the Google Chrome version, Links to click on in the other version) down the Left Hand Side which are labelled A to E. Down the Right hand side are the 5 text summaries B2yoR produced when reviewing the Videos before the 2yo made it's debut. The text summaries are also labelled A to E. But, the important point to note is that the Videos and Text are Mixed Up. Video A, for example, may, or may not, belong with with Text A, and so on. 1. Look through the 5 videos and rate them an a 1 to 5 Scale for how good and promising they look to you. With 1 = Poor Breeze, 3 = Average or Unremarkable Breeze & 5 = Very Good and promising Breeze. 2. Try to Match each Video to the B2yoR Text Description to produce 5 two letter Pairs. 3. Try to match the 5 Videos to one of the following 5 Sale Prices paid = 800,000gns, 36,000gns, 16,000gns, £85,000 & £5,000. The 5 Prices are the correct set for the 5 x 2yos in the Videos. The 'Answers' will be added to this Document at some point. Those keen to check their results before then please drop an e-mail to the usual B2yoR Contact address. Text A -> ".. In the gather lookes a solidly built medium one and balanced set-up all round. Presume he did a Fast Time given the price and he sets off the breeze showing a faster than average action and going all out. Uses his range well front & behind and goes straight and seems to handle the undulations very well. Gets tired in the last 0.5f. His sales picture also suggests he isn't a big & rangy one but a lower slung one with some length and body depth. His movement making him better? Jk Hughes has said Tiggy Wiggy flattens her body out to use her range and some suggestion of that here. See how that works out. " Text B -> ".... because it is THE WORST Breeze seen in the Videos so far. [2yo] looks very raw physically but seems an ok size and a deep bodied one of his sire. Gawky neck and a notable knee action in from make him look worse. In the breeze he never does the same thing twice in any of the strides he does. Also does a lot of hanging, jinking, fly jumping. Head always held well to the right & Jumps RH at one point and it would make you wonder whether he cannot see out of one eye or just having some sort of brain spasm. If it can be done wrong [2yo] does it. ....... price seems to reflect his apparent untrainability rather than his bulk." Text C -> "... a smaller one in his Breeze Video and does a poor breeze because of never getting balanced or going forward properly. " Text D -> "..breeze shows a Medium [sire] type with length and range and a longer neck. Ok build overall and depth front. Does an unremarkable breeze ...... getting into his galloping pace and maintains that to the finish. Mostly balanced other than when hits loose ground. Why the .... price? A bit smaller than Medium? If the one pace he gets to is just medium was his time slow? Why start him at 5.1f if that were the case. " Text E -> "...does a solid breeze and mostly what you would expect from a '[sire name]' in size & shape. Action probably not fully fast and a bit of lift & curl in front. When asked to go faster he looks very willing but seems to pound down harder in front rather than reaching out. Straight mover and a mostly straight Breeze (some drift Lh). Ok for 75"